When a friend gets engaged it’s always an exciting time. From the chit chat about rings, dates, dresses and beyond, talking about weddings and marriage seems to never get old. So for me, when the excitement of a friends engagement news settled down and I was honoured with the special request of making the wedding cake, needless to say I was unbelievably excited and so chuffed to be asked. Making your own wedding cake is one thing, but when doing it for someone else, particularly a close friend, funnily enough the standards are so much higher and you want everything to be absolutely perfect. I worked closely with the ‘bride to be’ on what kind of elements she wanted to incorporate into the cake, what was her style? What was the colour scheme? And probably most importantly what kind of cakes did she want? Brainstorming together we decided on an ivory and white cake, incorporating a touch of the pink which the bridesmaids would be wearing. The bride liked vintage style and fashion which encouraged me to incorporate vintage patterns and designs where possible. It was agreed that I would try and incorporate an ‘arch’ pattern to mirror the pattern on the wedding stationary and invitations. I knew I needed to make a five tier cake at least based on the number of guests. So from there I sketched out a design and the end result turned out to be really dramatic and fitted the brief exactly. 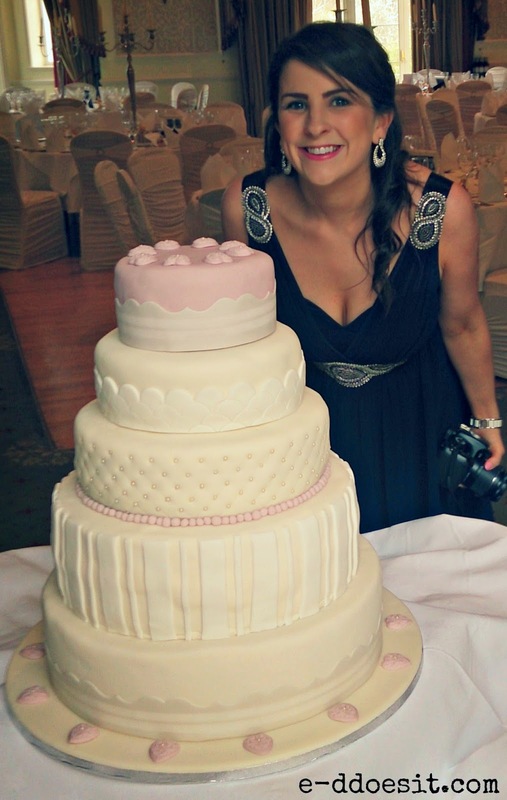 Luckily the cake photographed superbly, tasted delicious and most importantly was a hit with the beautiful bride. The cake was made up of 5 different tiers, each covered in roll out fondant icing and decorated with different detail in each tier. 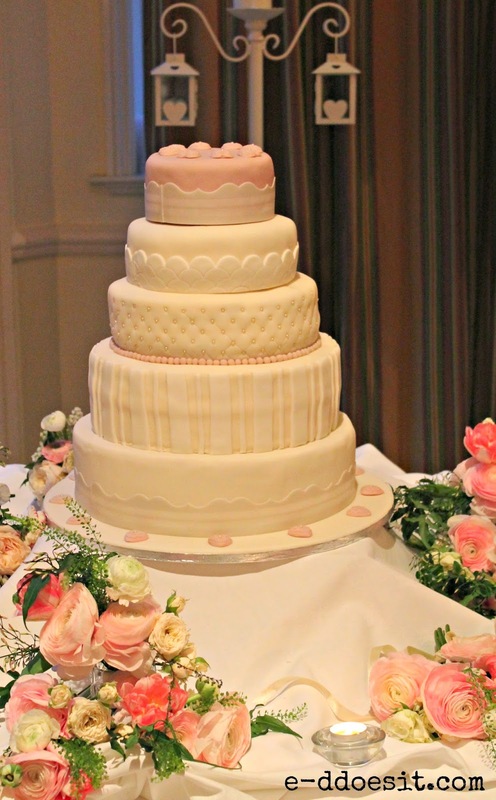 As the bride wanted to include a touch of pink in the cake to tie in her colour scheme, I opted to alternate pink and white as the accent colour on every second tier. This cake was covered in almond paste and then ivory fondant. I then created an ornate white and pearlised ivory belt which I wrapped around the cake. thin and thick white stripes which were cut to size and placed on the cake. This cake was decorated using a quilted effect embellished with perals. If this is a technique you are interested in trying, I highly recommend HappyCakesBakes YouTube Tutorial which gives an easy step by step guide. 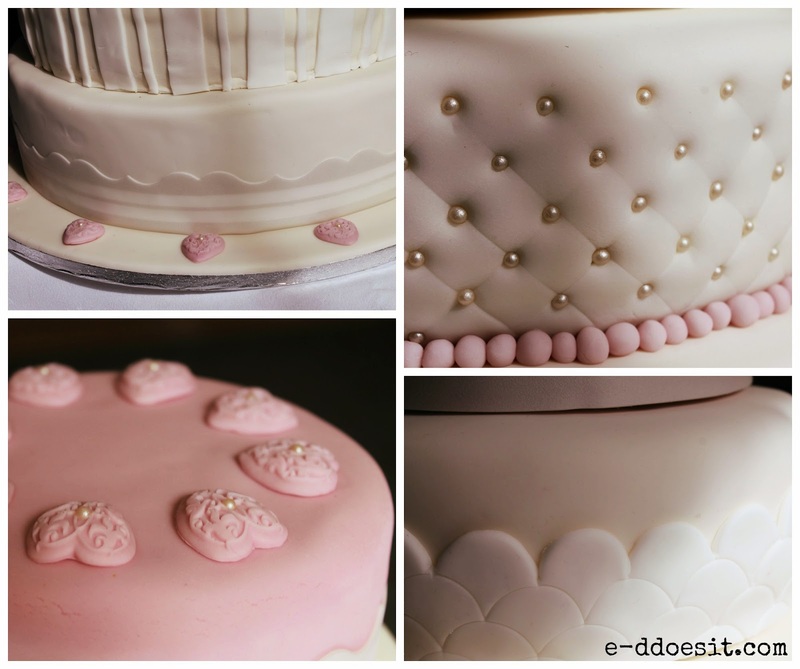 The base of the cake was decorated using tiny balls of fondant icing coloured in pink, which created a beading effect around the cake. This cake was also covered in ivory fondant. The arched pattern was achieved using a fondant belt cutter. This pattern tied in the pattern used on the couples stationary. 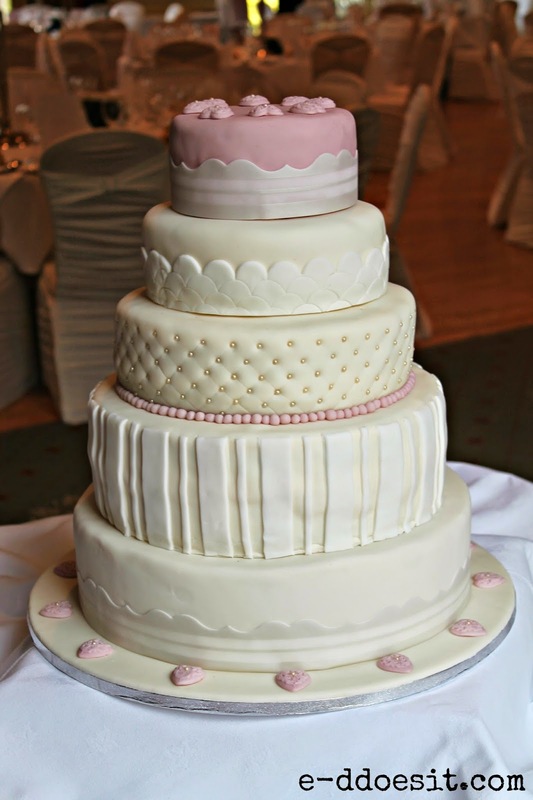 The top tier of the cake was covered in a pale pink fondant and wrapped in a matching ivory and pearl belt like the bottom tier. The ornate vintage hearts were made using a silicone mould. I then added a pearl to the centre of each heart to tie in the pearl detail on the third quilted tier of the cake. Hello. The blog about a Cakes you have shared here with the Delicious cakes pictures are really very nice. Making of Cake is really a God gifted Art. 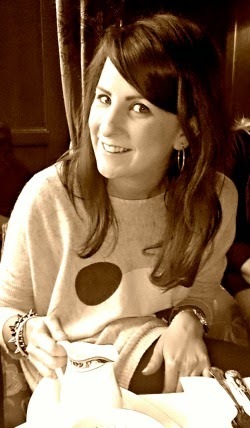 I also know one Baker, who provides their services in london with the different Luxury Wedding Cakes of many design. The above cakes are absolutely stunning, elegant and a work of art. Its the kind of cake I would have dreamed of having for my wedding too. And i will follow the Indian Wedding Trend in my wedding. Keep sharing. I will regularly visit your here.